HUFA was born from an outpouring of love and support after the death of Avchen (Harivel) Pinkard, a 33-year-old Vancouver physiotherapist, in July 2007. Avchen (pronounced Ahv-shin) and her unborn child died suddenly from a medical complication. Her husband Jeff requested that donations made in her memory go to a cause in Kenya close to her heart. Avchen had traveled through Africa in 2000 with a friend, Lindsey Davis. Their three-month trip took them to Zimbabwe, Zambia, Malawi, Tanzania and finally Kenya. They wanted to spend some time volunteering for children, and by chance were introduced to an inspiring Kenyan woman. This single mother of three boys had given up a good customer services job to dedicate her life to serving poor and orphaned children out of her own home. She was known as Mama Mercy. 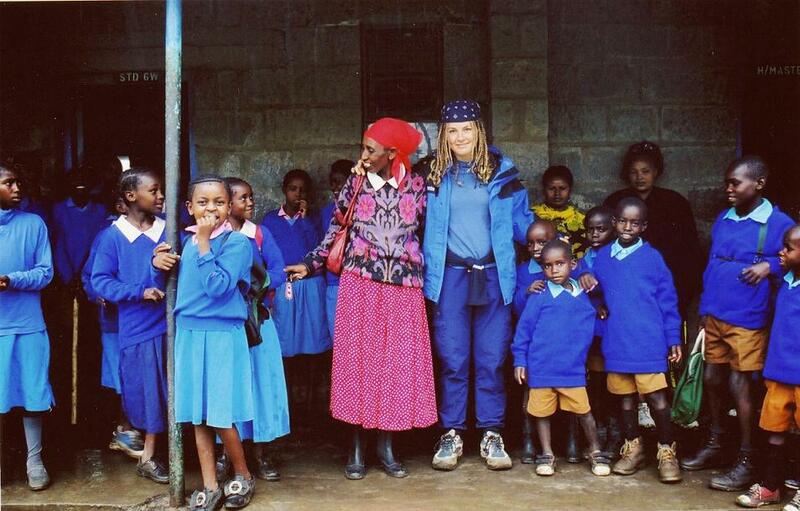 Avchen and Lindsey were deeply inspired by Mama Mercy’s tireless and single-handed efforts to clothe, feed, and educate children with no home or school to go to. Back in Canada, they raised funds to support Mama Mercy’s impressive but heavily under-funded work. They sponsored a child’s education, and sent clothing and school supplies. Eventually, contact with Mama Mercy (officially Elizabeth Mwangi) was lost. But following Avchen’s death, a friend traveling in Kenya – Hilary Cole – searched for Mama Mercy in her town in the Nairobi outskirts carrying a photo of Avchen and Mama Mercy taken seven years before. After much walking and inquiring, she found the woman still serving the poor with unwavering dedication. With this renewed contact, Avchen’s friends and family formed Hands Up for Africa (HUFA) to support the work which had so inspired her. HUFA’s first act as an official society was to help fund Mama Mercy’s 18-year vision of creating an orphanage for the children of her town, Ongata-Rongai. The new Board of Directors unanimously agreed to fund the construction of semi-permanent buildings on what had been an empty piece of land in the rural Kajiado District when Avchen and Lindsey had visited. With this momentum, Mama Mercy procured small amounts of money from her own family and church community to plant crops on the land to contribute to one of several feeding programs she was running in the most impoverished and AIDS-stricken communities. Two years later, through HUFA’s generous donors and corporate sponsors such as Lush Fresh Handmade Cosmetics and Planet Wheeler Foundation, the new Avchen Abigail Mercy Academy opened its doors. It now houses, cares for and educates nearly 60 of the area’s most vulnerable children.